We are Toronto's Premiere Limousine, Coach, Chauffeur, and Airport Shuttle company. Our commitment is your guarantee to dependable, safe, and affordable transportation everywhere in the GTA. Our Professional Limousine Services are perfect for Prom Limos, Weddings Limos, Business and Executive Travel Limos and any time you need to rent a limo. Call us today. We are Your Toronto Limo Company. Rent a Limo Today! 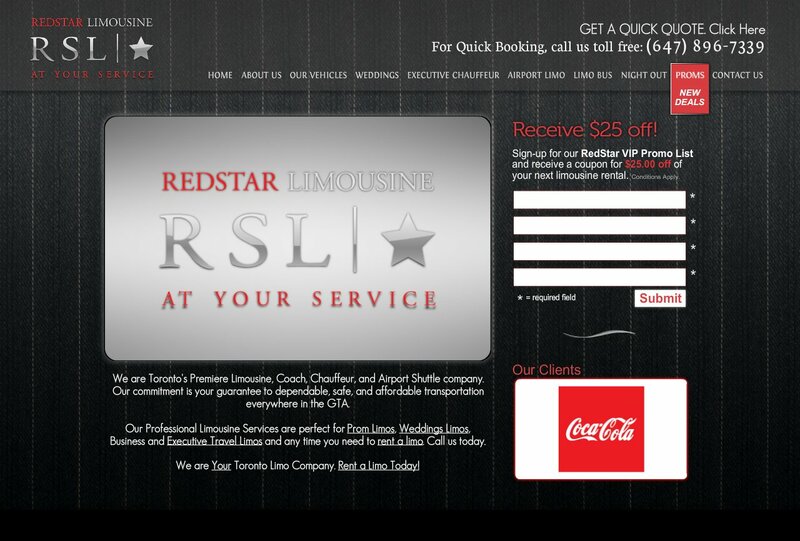 Sign-up for our RedStar VIP Promo List and receive a coupon for $25.00 off of your next limousine rental. Conditions Apply.